Today we speak with our baritone for our Wednesday and Saturday night Lucias di Lammermoor, Ljubomir Puškarić, making his Seattle Opera debuts in the role of Lucia's manipulative brother. First off, could you help us with the correct pronunciation of your name? LYU-boh-meer (with a rolled “r”) PUSH-car-eech, with an emphasis on the first syllable of both. Your character in Lucia, Enrico, doesn’t come off in the most favorable light. But what do you think about him? 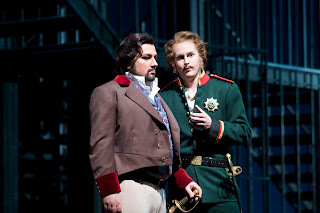 True, Enrico is bad guy in this opera, but there are a lot of musical places in this role that show he has emotions. I do not believe that he is strictly a bad guy! I would say that he is a weak person who is trying to cover it with violence. He is especially too weak to lead his family after the death of both parents. In this production, we have tried to explore this direction as much as we could, and it was a pure joy for me to have a chance to work with [Stage Director] Tomer Zvulun and Maestro Cinquegrani! It is so much more interesting to sing a role like this, instead of one that’s just a plain violent person. When you alternate a role with someone, as you do with Philip Cutlip for Enrico, do you pay attention to what the other singer is doing? For example, do you compare notes or discuss the role with each other? It was a great experience to have Philip as a partner in this production, along with all the other principals from both casts. I actually do not remember if we talked in detail about the role, but I was certainly paying attention when he was rehearsing because I was supposed to work on the same scene later. So it would definitively not be good if I had gone out and got some coffee instead! You grew up in Zagreb, Croatia. What is it like studying opera in Croatia? Is there a passionate opera following there? Croatian National Theatre in Zagreb celebrates its 150th birthday this season! There are certainly a lot of opera lovers in Zagreb, but also in all of Croatia, which has four opera houses. The one in Zagreb is the biggest, with a very long and busy season. Performances in CNT include opera, ballet, and drama, so every day there is a performance in the theatre, and the opera has about 12 productions each season. Studying opera is a lot more difficult in Croatia then in the U.S. For example, in Bloomington, Indiana, where I studied, a student has many opportunities and gets a chance to study, perform, and prepare himself for the start of his career. Everything you need is set on the table for you and it is just a question of if you are capable enough to take what is offered. Unfortunately, the Music Academy in Zagreb cannot compete with all those productions and facilities at Indiana University, due to a lack of funds. However, it is a lot cheaper to study in Croatia, starting from private lessons and coaching up through going to a university. Have you had time to explore the local Croatian community in Seattle? Actually I met a lot of Croats. During my first week here Arthur Woodley told me about Croatia Fest, which took place at Seattle Center on October 2nd and 3rd. So I went and met several people including the organizers. It is not often that somebody from Croatia sings at Seattle Opera so they wanted to announce that. I went on stage, introduced myself and talked a bit about the opera. Of course, I invited them all to see Lucia di Lammermoor. Some of them already went and some will come to see upcoming performances. That was nice, and I’m still in contact with some of them. Does speaking Croatian make it easier to sing in other Slavic languages, such as Russian? I saw that you recently sang in Boris Godunov. Since both are Slavic languages there are some similarities but not too many. However, I think that it is a lot easier for me to learn to sing in Russian than for someone who is not from a Slavic country. But in general it is easier for me to sing in Italian because I did not have a chance to sing in Russian a lot while studying. I read on your website that you studied journalism and worked as a journalist for five years. When was this, and why did you decide to leave journalism? Were you studying opera at the same time? My story is definitely not a typical one. After I finished high school I started to study journalism, but at the same time I started to sing in a big church chorus in Zagreb. Up until then, I had not had any contact with music, although I come from a musical family. I was more interested in sports, and starting when I was six, I trained for swimming, diving, athletics, soccer...when I started to study journalism, my idea was to become a sports writer. I started with radio, then got a job in the sports section of a Croatian daily newspaper. I liked it very much; I traveled, wrote interviews with several national soccer players who now play in England's Premier league as well as many more interesting stories. But during the time, I also got an opportunity to sing as a freelance chorus member in Zagreb's Opera house; it was Verdi's Aida and they needed actually a small chorus of freelance singers to sing the slaves. The chorus master of my church chorus was also the chorus master for the opera, and I was one of several people he thought capable of doing this job. It was completely new for me, but I was very happy! 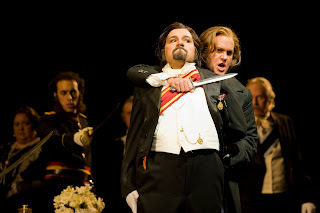 So, first I did Aida, then the same thing happened for Don Carlo and Boris Godunov in next two years. I was able to work both jobs, since the hours did not interfere too much at that time. Then, in spring 2005, I was asked to to sing in the opera chorus at every performance--that was the time of big decisions. I was not sure if I could pull that off because of my journalism job but I decided to try. My parents were not thrilled about that because they, as musicians, know how hard it is to make a living in music. And none of us knew whether I had any talent. Along with all this, I was taking private voice lessons, so my schedule was pretty full. I had a small scooter, that saved me enormous amount of driving time and parking money. Also, I had a great editor at the newspaper who was not so strict about some things. I was able to work like that for about a year. But then the music director at the opera heard me and gave me a chance in several smaller roles. And I realized that my greatest talent is singing, not writing. Eventually I stopped working as a journalist and concentrated on singing. 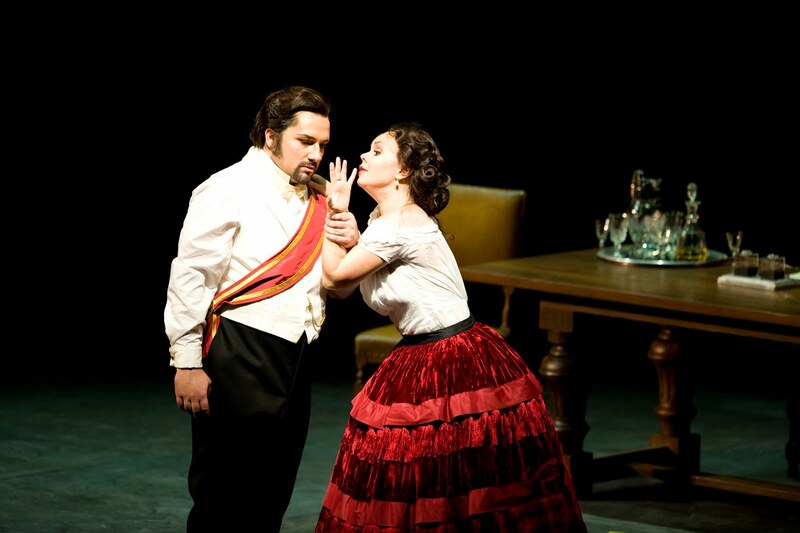 I sang Figaro in Barber of Seville in two productions, in Zagreb and Rijeka, during my first year at the Music Academy. Everything was moving too fast, so I decided to take some time and study without having to work at the same time. I moved to the U.S., where I learned so much in two years in Bloomington, got a lot of knowledge, experience, contacts, and excellent management and now I am prepared for "second" start of my career. None of that would be possible without amazing efforts of my teacher Dr. Robert Harrison, my accompanist Davis Hart, but also Carol Vaness and Robert Porco. For now, all is going really well and I very grateful to Mr. Jenkins who gave me a chance to sing Enrico in Seattle. 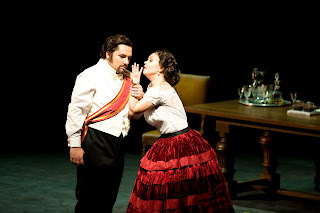 Photos of Lucia di Lammermoor at Seattle Opera by Rozarii Lynch.